UFC star Conor McGregor says he is keen on a rematch with Khabib Nurmagomedov after his heavy defeat in Las Vegas yesterday. 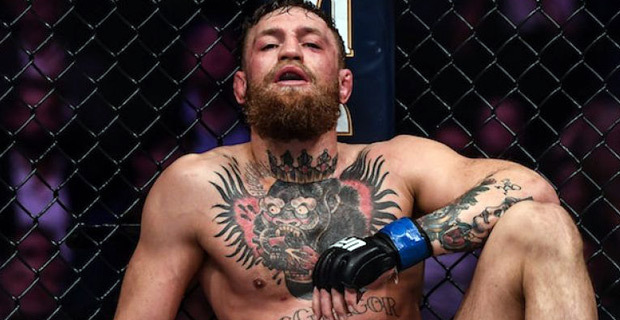 Ugly scenes marred the UFC Lightweight title fight at the T‑Mobile Arena after Nurmagomedov jumped out of the Octagon to fight McGregor's team‑mate Dillon Danis following his submission win. Things then took a turn for the worse when members of Khabib's team climbed into the Octagon where McGregor was punched and attacked in scenes UFC owner Dana White described as a 'disgrace'. Security quickly broke up both melees and three men from Khabib's corner were arrested, although McGregor opted not to press charges and they were released. Nurmagomedov now moves to 27 straight wins with no defeats in UFC, although White refused to hand Nurmagomedov his belt after the fight and is yet to sanction his 1.5million pounds fight purse. McGregor has received his 2 million pounds fight money. Nurmagomedov says he wants to say sorry to athletic commission and Las Vegas and this is not his best side. Tension has been high between the two, with McGregor hurling personal insults at his rival over the last 12 months while injuring two fighters on a bus with Khabib when the Irishman threw a metal trolley at one of its windows in Brooklyn last year.